A trio of local community members spoke to the Keizer City Council about the continued efforts to end domestic violence at its meeting Monday, Oct. 15. 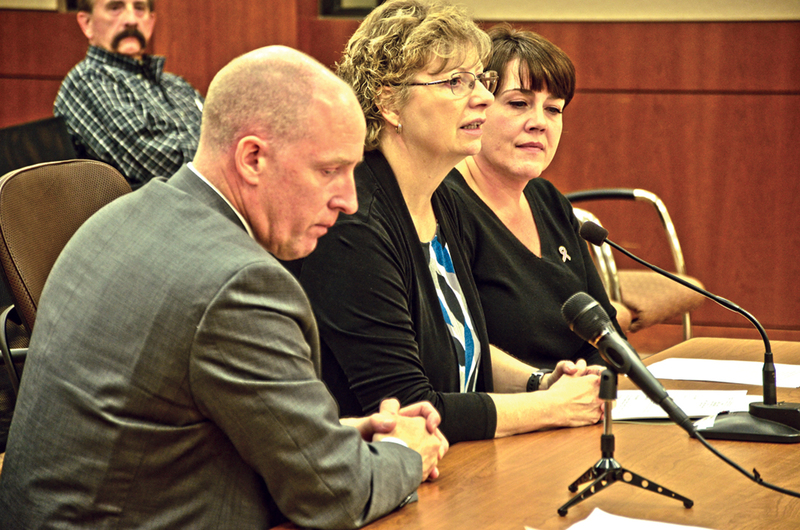 District Attorney Walt Beglau, Deputy District Attorney Kim Larson and Jane Downing, executive director of the Center for Hope and Safety (CHS), talked with the council as Mayor Cathy Clark declared it Domestic Violence Awareness Month. “We have teamed up for years that it continues to be a prevailing and tragic crime day in and day out. These range from shoving and pushing to murder. I have an entire team of deputy district attorneys to manage 1,000 cases of violence,” Beglau said. The number of cases merits a “continuous and unrelenting dialogue about domestic violence in our community,” he added. Beglau also complimented the efforts of the Keizer Police Department in regard to combatting domestic violence. Nearly 80 percent of domestic violence cases forwarded to the district attorney’s office result in filing of charges against the aggressor. “The chief and his staff are doing an extraordinary job of investigating and giving us cases where we can hold people accountable,” Beglau said. Downing said efforts to expand access to the CHS prove that the problem isn’t going away. “We opened an advocacy office in downtown Salem two years ago. In the first year, we doubled the number of contacts from people needing our services. They doubled again last year,” Downing said. Last year, CHS had more than 22,000 contacts from domestic violence victims between offices in Salem and Woodburn. CHS recently opened a new shelter and is now working on a capital campaign to add kennels for domestic violence victims whose pets also need shelter. Larson, who heads a victim assistance team within the District Attorney’s office, said efforts have focused on two areas: training and advocacy. Staff from the victim’s assistance team have trained police on the best investigation techniques and local faith leaders on how to access support services when a member of their clergy comes forward to seek help. “We’ve also worked hard recently to shore up what we do with victims who desire restraining orders,” Larson said. Victims can now choose to appear in court with an advocate at their side or even appear in court through video conferencing without needing to be in the same room as their abuser. The team has also recently added a juvenile advocate for families with children that are experiencing domestic violence issues.